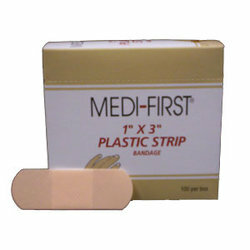 Medi-First Plastic Bandage Strips - 100 Count. Perfect to restock you First-Aid kit or keep the box in a cabinet or drawer at the office. Each box contains 100 1" x 3" latex Free Plastic Bandages. Medi-First Plastic Bandage Strips - 100 Count. Each box contains 100 1' x 3" latex free plastic bandages. Designed to restock you First Aid Cabinet or can be easily stored in a cabinet or drawer.